Professor Emeritus of Geography, University of North Carolina at Charlotte, 2010. 2010 population statistics added by the Government & Heritage Library, 2011. This analysis of population trends derives primarily from US Census Bureau estimates through 2005. In addition, 2002 estimates for the ethnic populations of counties were released in September, 2003. In some cases, 1990-2000 data are still shown because they represent a longer period of time and are based on actual counts, rather than estimates. However, the estimates for 2005 are used for analysis of total population change at the county level. The NC State Demographer prepared population projections out to the year 2030 and they are used in this analysis, as noted in the various maps and charts. North Carolina continues its recent, strong population growth, as is shown in the following sections. A large part of this growth has taken places in metropolitan areas, especially in Charlotte and Raleigh-Durham. This strong, urban-oriented growth is in marked contrast with North Carolina’s historic character as a slow growing, predominantly rural state. The leading component in this growth has been from people moving into the state. For example, between 1990 and 2005 these net in-migrants totaled 1.4 million, a large majority of total growth. However, estimates for the 2000-2004 period reveal an ominous increase in the number of counties in which more people left than moved in. Major parts of the in-migration of people were accounted for by Hispanics and Asians, as well as by people moving in from other parts of the country and the rest of the world. Another important aspect of recent and projected future change is the increase in the elderly population. This reflects both the national “graying” of the population but also the fact that North Carolina is a popular retirement destination. Finally, the state’s population is projected to pass 12 million by 2030, an increase of nearly 55 percent over the 2000 total of over 8 million. All of these trends and more can be seen in greater detail in the following sections. US Census Bureau estimates for state populations as of July 1, 2007 show that North Carolina's total had reached 9,061,032 by that date. This represents an increase of 12.6 percent since 2000, well above the national growth rate of 7.2 percent. The state was the 6th fastest growing between 2000 and 2007. 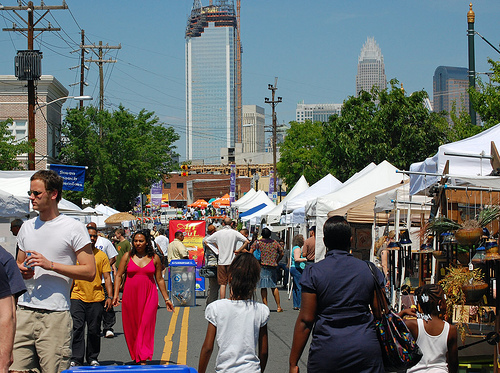 This rapid growth led to North Carolina passing New Jersey to become the nation's 10th most populous. These estimates for 2007 were available only at the state level and not for counties. The 2005 population estimates are for entire states only and do not include counties or breakouts of natural increase, net migration or ethnic/racial components. "American Factfinder." 2011. U. S. Census Bureau. Online at http://factfinder2.census.gov/. Accessed 3/3/2011. Stuart, Alfred w. ed. 2010. North Carolina Atlas Revisited. 1 January 2010 | Stuart, Alfred W.